Listen in to hear what it takes to start a Commentary On Fire and off-air banter post-commentary follows with the trio of Stoo, Ken and Mike Leeder. 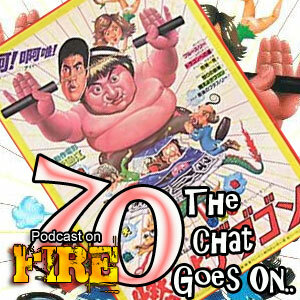 It managed to be fun, informative and LONG enough to warrant a little regular Podcast On Fire. Have fun! Personal Thought: It’s the future. People are on Hover boards, Mobile Phones are at your finger tips, no really they are! This film is filled with wire work and CGI effects which is some times on the good side and the bad. Yet if you aren’t a fan of the CGI and wire work maybe the cast will interest you; Alex Wang (Chinese Strike force), Stephen Fung (Gen-X-Cops), Chin Kar-Lok (Operation Scorpio), Gigi Leung (First Option) And Kristy Yeung (Storm Riders). Apart from the young there is two classic actors included Sammo Hung and Yuen Biao!